What Does “Check Your Privilege” Really Mean? White people who want to talk about or be politically active around issues of race in America are often instructed to “Check our privilege.” But we’ve never taken the time understand what that really means. We usually take “Check your privilege” as an admonition, like someone is telling us to sit down and shut up. And often, yes, the first step of the accountable white person is to sit down and shut up. But it’s only the first step. Sit down and shut up so you can listen to Black people, read Black writers, and learn about everything your whiteness has shielded you from. This is an important step, one that hopefully many of you have taken since Trayvon Martin was killed in 2011, or since Ferguson exploded two years ago this August, or since The New Jim Crow hit the New York Times Bestseller List, or whatever event first cracked the glass bubble of your whiteness. Hopefully you’ve read some books by now. If not, here’s a list. Really CHECKING your privilege means making an asset map. CRC(A) member Forrest Schmidt drives the sound truck for a demonstration led by the Anti Police-Terror Project. Brainstorm a list of all the skills, resources and relationships that you have access to. You know how to run payroll? That’s a skill, write it down. Your church would let you host an organizing meeting without charging you for the space? That’s a resource, right it down. The most relationships list is the most important. Who is in your circle of influence? Skills, resources and relationships. Give it some thought, make a list, write it down. 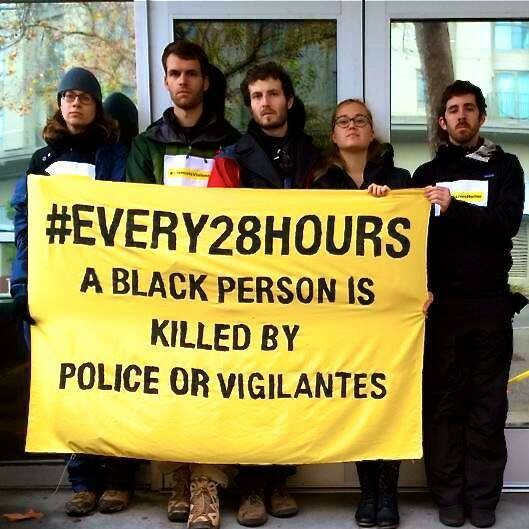 White allies shut down the Oakland Police Department Headquarters in December 2014. Now that you have your asset map, you know exactly how much and what kind of white privilege you have! You have thoroughly checked your privilege. Now you just have to learn how to use it. These are the 5 methods that members of CRC(A), the white ally/accomplice wing of our organization, use every day. Organization — build relationships with other white people who are capable of united action to support Black freedom struggles. Build anti-racist consciousness among white people through education and relationship building. Organize white people with anti-racist politics and political potential to join, participate in, and build anti-racist campaigns and organizations. 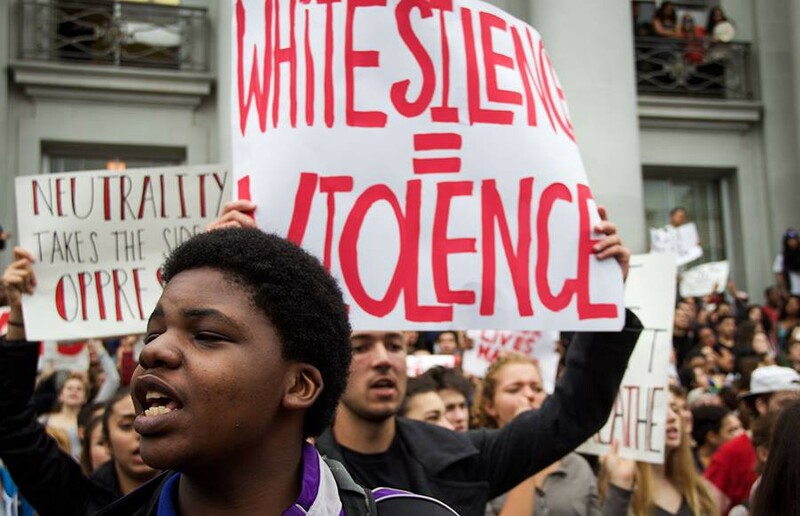 Showing Up for Racial Justice is a great example of white anti-racist self-organization. 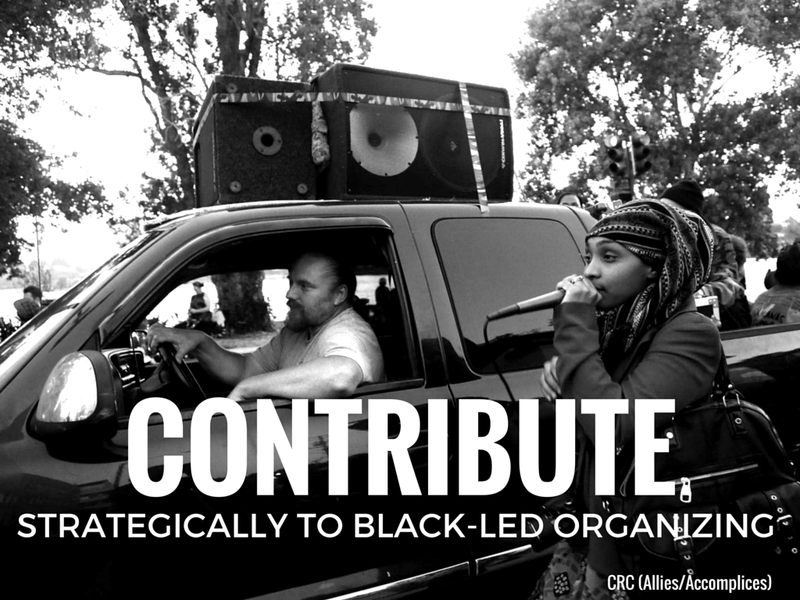 Contribution — strategically, pro-actively contribute to Black-led organizations and campaigns. Get in where you fit in. You have your asset map — what are you bringing to the table? Remember, you’re making a contribution, and hopefully a valuable one, but that doesn’t give you the right to demand political leadership or control of whatever organization/campaign you’re involved with. Infiltration — Infiltrate white and wealthy spaces to gather information, shape politics/policies, and secure resources for the movement in direct accountability to Black leadership. This can be as simple and innocuous as joining your neighborhood listserv and reminding people not to call the cops on people for walking while Black. One of our allies convinced her employer to make a donation to a local housing rights organization to offset the company’s impact on the displacement of Black people from Oakland. Infiltrating in this sense is just taking advantage of the fact that racist white people trust you. Get creative. Intervention — Intervene in actions taken by majority-white or white-led organizations, leaders, or community members that are harmful to Black people and other disenfranchised groups. Calling In — “Call in” well-intentioned white folks to become more cognizant of white oppression of Black people and work to better reflect anti-racist analysis in their actions, speech, and use of power/resources. Calling Out — “Call out” white folks who are clearly invested in maintaining and enforcing white supremacy through their actions, speech, and use of power/resources; use various political tactics to isolate, neutralize, and/or embarrass these forces. 5. Reparations — In recognition of the fact that all white wealth (that includes our earning potential, leisure time, relative control over our daily lives, etc) is stolen wealth, allies & accomplices should make reparations work a central part of their political practice, and organize other white folks to make reparations in addition to making our own personal contributions. Our reparations practices include direct contributions of money and other resources, fundraising labor, child care, administrative tasks, the jobs nobody wants to do, and being committed to being the last to speak, the last to take credit and the last to get paid for the work we do. What do you think? Let us know your thoughts and questions in the comments. And if you appreciated this article, we’d appreciate you clicking that little heart icon so that more people can read it.